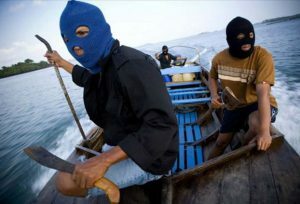 Two crew members of an offshore supply vessel were weekend kidnapped by pirates, while their ship was underway around 97 nautical miles South West of Brass, Nigeria. According to the information provided by the International Maritime Bureau’s (IMB) piracy reporting center, a group of pirates attacked and boarded an unidentified offshore supply vessel while underway on April 19th. The crew managed to raise the alarm and non-essential crew members retreated into the citadel. Once onboard, pirates robbed and kidnapped two crew members, identified as the vessel’s Captain and Chief Engineer. All remaining crew are reported to be safe and proceeding to a safe port. Two more attacks occurred on the same day in the region. Namely, seven pirates armed with guns approached a Panama-flagged tanker some 58 nautical miles south west of Brass, Nigeria. However, the crew activated the water hose and master commenced evasive maneuvers that enabled the ship to fend off the attack. “Due to the high free board and hardening measures deployed by the vessel, the pirates aborted the attack and moved away,” the reporting centre said. All crew of 28 members are reported to be safe. The third target of the day was a multipurpose offshore vessel which was attacked by pirates causing damage to the bridge. However, the crew managed to escape pirates by retreating to the citadel and has been escorted to Agbami terminal. The pirate activity did not subside the day after, as a Spanish-flagged LNG tanker was attacked on route to Port Harcourt. The ship’s identity has not been disclosed, but it is believed that the ship is Bilbao Knutsen, owned by Knutsen OAS. The attack has been confirmed to World Maritime News by UK-based security agency Clearwater, saying that this incident is the sixth incident that occurred in and around this area within 24hrs. The LNG tanker managed to thwart the attack and proceeded to Bonny with all crew members accounted for. Clearwater received reports of two further separate pirate attacks on Wednesday targeting two offshore supply vessels in close proximity. A Nigerian Navy vessel has been tasked and managed to deter the pirates from the scene. All crew members are accounted for and the vessels were escorted by the navy to Onne port, reports World Maritime News. Meanwhile, Indonesia has issued a warning to all vessels to stay clear of transiting areas around the southern Philippines as the number of hijackings along the shipping route between the Philippines and Indonesia increases, according to Reuters. Furthermore, the US Department of State has issued a warning to US citizens “to avoid all non-essential travel to the Sulu Archipelago and through the southern Sulu Sea, and to exercise extreme caution when traveling to the island of Mindanao,” due to continued terrorist threats, insurgent activities and kidnappings, reports World Maritime News.